Looking after a newborn foal comes with huge responsibilities, including how the foal will be fed, weaned, handled and educated. These events will shape your young horse’s life and play a vital role in their future. Below are 8 top tips to assist you with caring for a newborn foal. Once your foal has arrived into the world it is important to ensure that they receive an adequate amount of high quality colostrum. Colostrum is the first mother’s milk available from the mare to the foal straight after birth. It is thick, creamy, and yellow-coloured compared to the white appearance of normal milk and contains high concentrations of antibodies, protein, transfer factors, minerals and other essential nutrients necessary for foal survival that provides immunity for the foal against diseases. 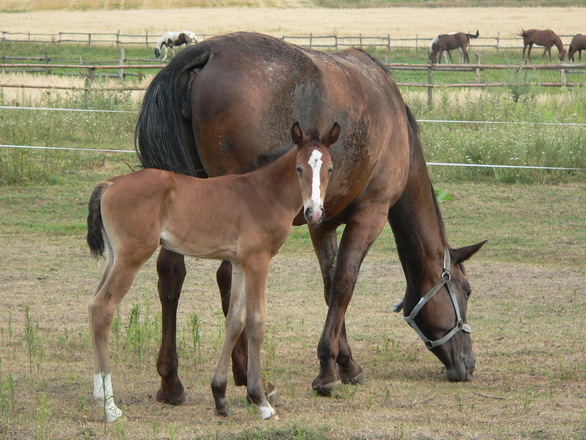 In the first few hours of life, a newborn foal is entirely dependent on the maternal antibodies being absorbed following ingestion of colostrum from the mare. If the foal does not receive enough colostrum its risk of infection will be high and chance of survival low. The antibodies are absorbed by the foal’s intestinal tract for up to 36 hours after birth, but absorptive ability begins decreasing drastically at 12 hours after birth. Therefore it is very important that the foal receives this colostrum before this time has passed. In the case where a mare has difficulties nursing you can give a newborn foal Transfer Factor Classic. This product contains high amounts of transfer factors that assist in educating their immune systems to be intelligent, vigilant and strong. The transfer factors in Transfer Factor Classic come from cow colostrum (only) and are also beneficial for puppies and kittens. You must ensure that water is available for the mare and foal at all times and the larger the trough the better. Water assists the mare with the production of her milk and it is also another form of liquid for the foal to drink. Although your foal won’t drink like the mare, they will play with the water and when it is time to wean, they will quickly revert to drinking it. A foal requires special care and it is important to keep your foal warm and dry. You must provide a clean, dry, well ventilated but draught-free environment that is sheltered from the wind and rain. Foals should be stabled at night when the weather is wet and cold and covered with a lightweight rug for additional warmth. If the weather is warm and dry there is no need to stable the foal but a companion should be available if they are left in a paddock or yard overnight. 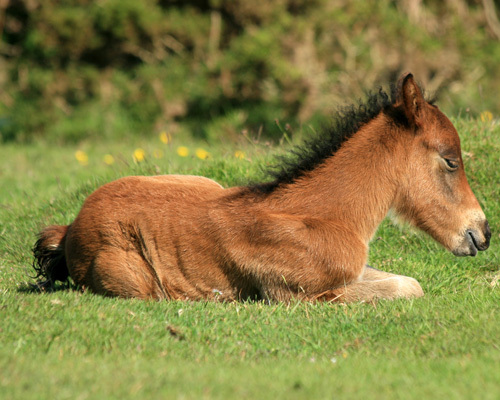 As an owner of a newborn foal you should always ensure that their paddock is a safe area. A good foal pasture needs to be clean, free from obstacles and allows your foal daily access to outside paddocks for exercise and sunlight. An ideal paddock size is half a hectare per foal. Paddocks should be well drained, sheltered and rotated, if possible, and kept clean with droppings collected daily. Fences must be safe, secure, highly visible and high enough so that the mare cannot jump over them. Foals will actively seek out solid food within the first few days of life and many will try to consume their mother’s feed. This is why most breeders use a Creep Feeder Program. Creep feeding is simply a method of feeding foals so that they have access to feed where the mare doesn’t. A simple creep feeder can be made from a small pen that allows the foal to enter and exit at any time but the mare cannot fit through. It consists of an internal feed trough which contains balanced, high quality, concentrated pellets prepared especially for young nursing foals prior to being weaned. Their feed must include high-quality sources of amino acids and well balanced levels of vitamins and minerals including calcium, phosphorus, copper, zinc and selenium. Providing foals with a creep feeder has been shown to improve the growth and development of young foals and decreased the stress of weaning later on in their life. By the time your foal is 5 months old, their digestive tract has developed sufficiently enough to process grain and they are psychologically ready to leave their mother. To begin the weaning process you first start by cutting back on the mare’s calories to help reduce her milk production. About a week prior to weaning, cut the mare’s calorie intake back by approximately 20 percent, by halving the grain ration. Three days prior to weaning, cut calories again to about 20 percent by removing all grain. This gradual tapering of the mare’s feed intake helps her to begin drying up so she will be less likely to have problems with a swollen udder or mastitis. Secondly, less milk means a hungrier foal who will become more interested in other sources of food and water. The enormous daily weight gain during your foal’s first six months gradually tapers off as they approach a year old. Continue to feed good-quality hay supplemented with a grain-mix formulated to balance the minerals in the hay. As the yearling approaches 2 years of age, they will have gained more than 90 percent of their adult body weight and height. It is important to allow your foal free-choice exercise on a daily basis. This is paramount in helping them build their bone density, strengthen their muscles and tendons, and develop their coordination. Confinement in a stall should never exceed any more that 10 hours. Sunshine and romping through the pasture unfettered is great exercise for your foal. From birth through to weaning and up until their first birthday is the best time to train your new foal. During this time, young horses are most curious, least fearful and mostly open to the formation of new relationships and new activities. It is during this time that you should teach your foal to accept handling and husbandry behaviour. accept brushing, as well as general body and hoof handling. With a foundation of basic training, you can expand your foal’s education by including such things as standing tied, accepting the presence of common things like paper bags, plastic tarps, clippers, being loaded onto a trailer and walking over unusual surfaces. Dr Steve Slagle, a Veterinarian in Granite Bay, California, has been using the transfer factor products in his practice since 1999. In his experience he has found that transfer factors are beneficial for use in newborn foals and horses. For more information on transfer factors with horses and foals please go to the Horses and Foals page on this website.